all this happiness: Chasing Spring. The weather is bad again. I am all rainy and soggy running around in my keds, still waiting for it to be summer. I try not to constantly talk about the weather, to be always waiting for it to get better, but it seems in recent years that it agitates my mood more than it used to. In the meantime I have sunny pictures to look at while I constantly check the 10-day weather report. I stared at this dress on etsy for ages, and when it went on sale I snapped it up instantly. It's different than I thought it would be, less fitted than I expected somehow, which is kid of a nice surprise anyway. It's quite a tattered little thing, but I couldn't wait any longer to wear it. I stitched up the hem a bit in places, but left a tiny stain and some of the teeny bits that are a bit raggedy. It's another one of the hoarded spring/summer dresses from the winter, and I love it if only for its funny buttons and color. I know what you mean about the weather dictating the mood...and I never used to be like that, either. I was blissfully ignorant whether it was raining or sunny or what, but now I'm always checking the forecast and hoping for sun and warmth! very pretty dress! love your outfits! i love the color of this dress -- it really suits your complexion! That dress is beautiful. I absolutely love the colour! 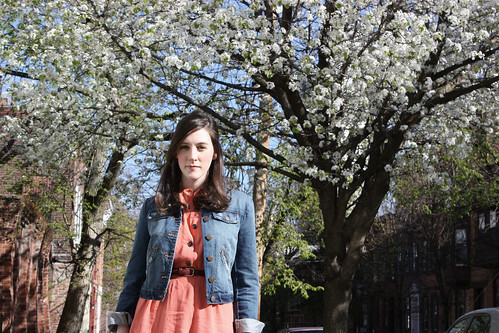 That dress is great colour - love the blossom in the trees too. gorgeous dress and love your denim jacket, you look so pretty! Ah, I love the full-ish skirt on the dress. So perfect! I love the rich salmon color! And those buttons look cute from here! I really like this dress and its colour. Beautiful. 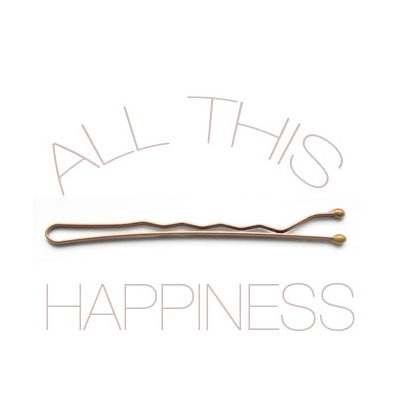 Love the way you matched it too. That is such a gorgeous color. 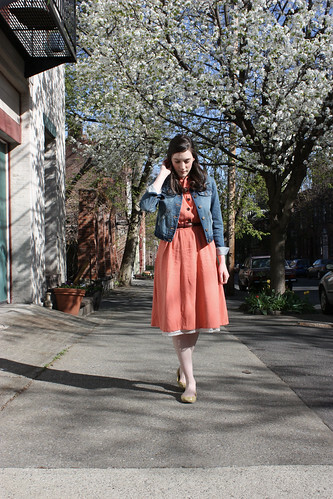 I love the denim jacket with the vintage dress, lovely !! <33 Thank you everyone! The color was one of the things that made me think I had to grab it. It's so summery! <3 You are all so lovely, with such nice words. I found your blog through little boat. You are just darling. Love the denim jacket and dress combo--very pretty! love the outfit! I really wish it was summer where I am too - right now it's raining like crazy! Tattered? Hmm, I love it anyways. And, especially, avec the jean jacket. you look really pretty and so sweet! !